Welcoming autumn season in Sydney, The Mews restaurant in Mosman has some new meals to be enjoyed along this season. The Mews is located close to Spit junction and it also close to the bus stop so taking a bus to the place is quite convenience. It was my first time visiting the restaurant and I came with some foodies friend. Pssstt for your info, if you come to The Mews on a nice sunny day, I suggest you to pick the outdoor seating area. The place is quite popular in Mosman and you might want to come early to avoid long queue for your lunch. This place is known for its eye-popping and pretty meals presentation on your lunch plate. 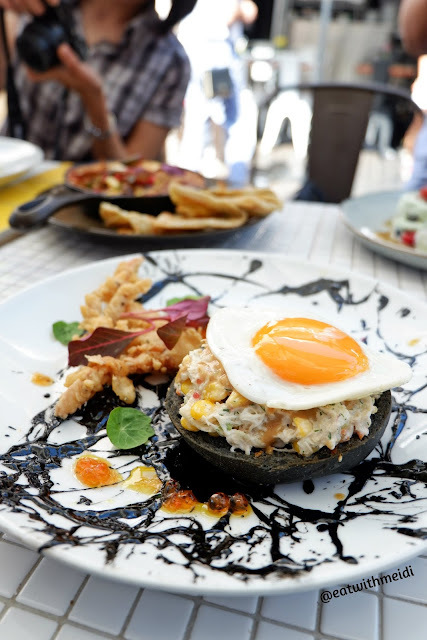 I ordered Crabs in Black ($20) which is soft shell crab, charred sweet corns and fried egg on the top of charcoal brioche served with black aioli and salmon caviar. The amount of crab meat was really generous and the taste was really good and not to mention the crispy fried crab shell. The presentation of the black aioli on the plate was resembling a painting and the taste of black aioli was really suit to the whole meal. 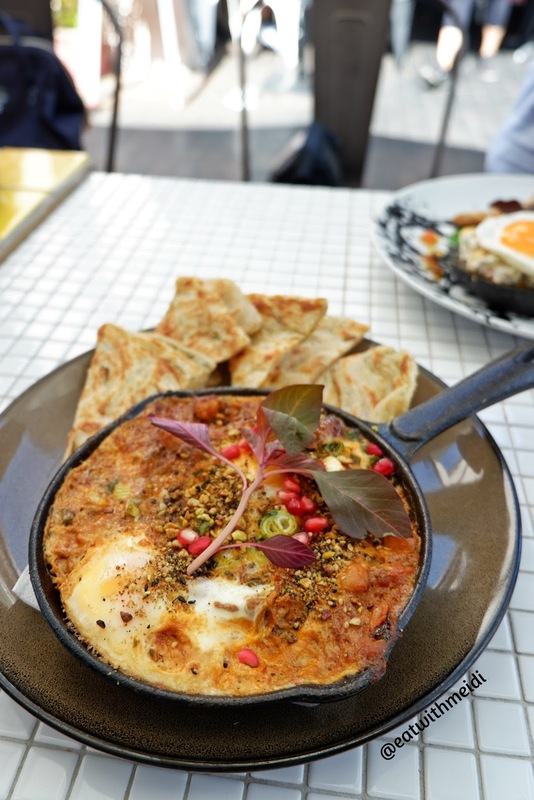 Helina ordered braised pork shakshuka ($18) which is baked eggs with braised pork, red capsicum, tomatoes, chickpeas, feta cheese, pistachio dukkah and roti. 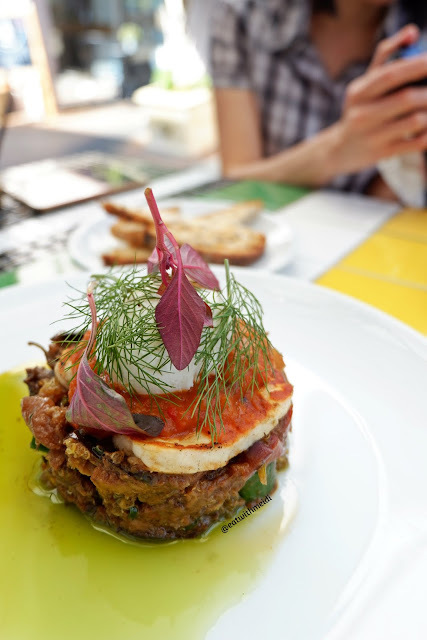 Clarisse ordered grilled halloumi stack ($17) which is spiced eggplant, heirloom tomato, cucumber, tomato relish, crispy quinoa, grilled halloumi, poached egg and green balsamic served with sourdough toast. I like its sweet and sour taste which is come from tomato relish. To complete the meal, we ordered ricotta hotcake ($16) for sharing as our dessert. 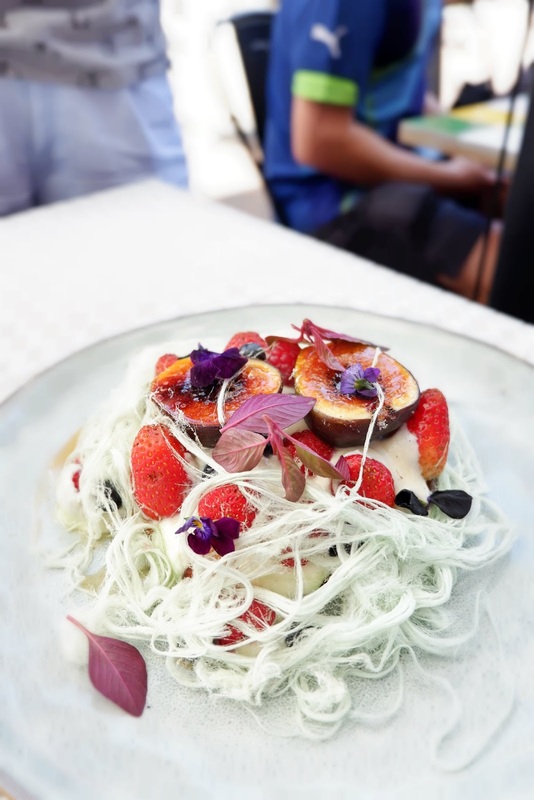 This hotcake is topped with whipped ricotta, fresh berries, caramelized fig, fairy floss and maple syrup. It was super pretty and delicious. I never had a hotcake with whipped ricotta and it turned out really good. If you are searching some photo of this dish on Instagram you might find they have many different fairy floss colors, on that day I had white color. Overall I had a really great lunch at The Mews and will looking forward for its new creation in the future. You guys keen to visit this restaurant too, aren't you?